Here’s my paycheck for teaching ESL part-time for the month of May. “Read ’em and weep boys” That’s what an instructor I used to know would say as he handed back his students’ graded exams. Same could be said for paychecks in Peru. I only taught 2 classes, or about 4 hours a day, 18 days per month. The grand total is S/.800 (~ $280). Notice how S/.104 (~$35) is deducted for my retirement and my employer generously chips in S/.72 (~$25) for EsSalud health insurance. I take home S/.696 (~$250) at the end of the month. Not that I’m an ungrateful gringo, I just do the teaching job for fun, it’s a nice way to meet local people and get out of the house for a few hours. For a single person who wants to spend a few months in Latin America teaching ESL is actually a good gig. If you work full time (4 classes ~ 8 hrs / day) you can make about S/. 1,500 (~$500) per month, enough to cover your living expenses down here. At ICPNA my pay is actually better than average for Peru. The minimum wage in Peru is around S/.550 (~$180) per month, average starting wages in Cusco for respectable jobs like drivers, nurses or teachers are around S/.800 (~$280) per month – full time. 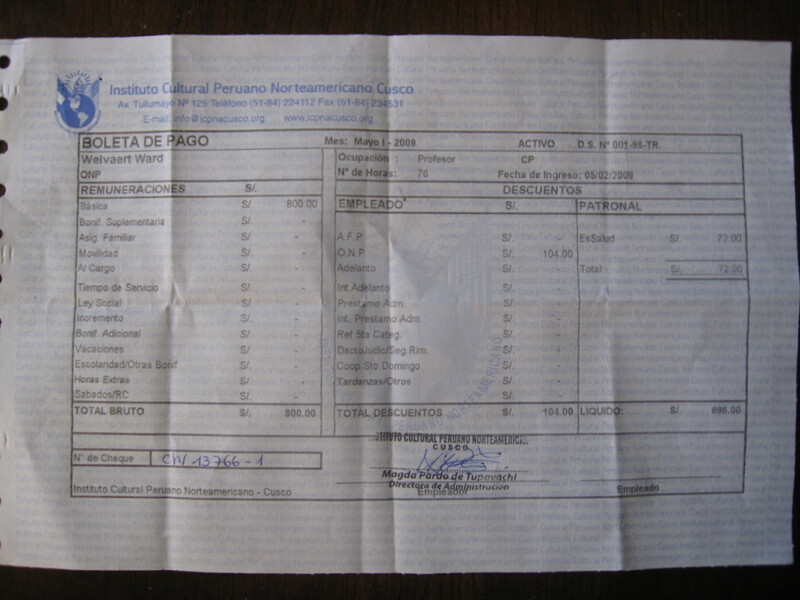 This entry was tagged boleta de pago, business, Cusco, economy, Peru, Teaching ESL. Bookmark the permalink. I’ve been teaching for just over a month and I’ll agree it is fun. Something ought to also be said for improving your Spanish. I certainly learn more about language in general as well as extra Spanish vocabulary. Good to hear you enjoy teaching up there! Ward, you are so right about the pay scale in Peru being pitiful. Good for you for posting about this. At least it lets other gringos know what they’re in for. The math might work out if you’re 23 years old, as you say. Sorry we didn’t get in touch when we were in Cusco this week. The Qoyllur Rit’i expedition was successful but we were exhausted afterward and just collapsed at my cousin’s hostal. We were dead to the world. I stumbled across this blog while trying to research RN wages in Cusco. I would move there in a heart beat, but I have some hefty U.S. student loans. If anyone has any insight, I would be SO grateful! !